Richard and Pat were the first to receive the Lawson Award named in their honor. Carol is the Development Director for ChristianWorks for Children, a non-profit agency that offers adoption, family counseling grief support, and divorce support services. She has Bachelor and Masters Degrees in Social Work, from Oklahoma Christian University and the University of Texas at Arlington. A member of the Academy of Certified Social Workers, Carol has spent her entire career at ChristianWorks for Children, serving as Director of Social Services for over ten years, and currently working in development. 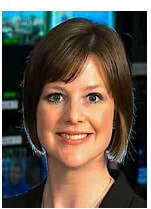 Meagan has worked at WFAA Channel 8 for nine years. She was the winner of 13 Lone Star Emmys, numerous regional Edward R Murrow awards and the National Service to America Award. A recent notable project of Meagan’s was the production of the JFK 50th anniversary coverage in November 2013. She started a cancer charity “The Portrait Project: Courage and Cancer” which provides portraits to kids fighting cancer. Meagan is married to Kevin Harris and mother to three-year-old Kadie.